We need a much simpler principled exposition of the intent of QVTc/QVTr. Since Perdita has correctly come to such unwelcome conclusions, we clearly have a problem. The new statement should be uncontroversial and therefore provide a reference against which subsequent text can be assessed. The following is perhaps what is needed, but needs more discussion with QVTr users and prototyping of its implications. • Check-only transformations to verify that models are related in a specified way. • Incremental updates (in any direction) when one related model is changed after an initial execution. A Declarative QVT transformation capability establishes a correspondence between source objects in one or more source models and transformed objects in one or more transformed models. The correspondence may be used to check or enforce a view of, or a transformation to, target objects in one or more target models. The correspondence takes the form of trace data comprising a set of trace records. Each trace record identifies a relationship to one or more transformed objects from, one or more, source or transformed, objects or values. The production of each transformed object is traced by exactly one trace record. The trace data includes relationships for all satisfied constraints imposed by the language constructs that express the transformation program. No relationships for satisfiable constraints are omitted from the trace data. In practice a Core language (and hence the Relations language) transformation is executed after a form, mode and direction have been selected. 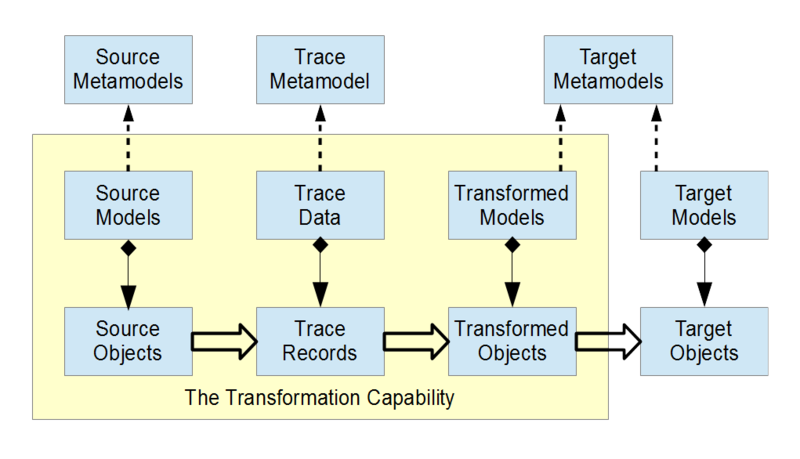 For a Transformation execution, there is an exactly 1:1 mapping between the transformed objects and the target objects. For a View execution, there is an exactly 1:1 mapping between the transformed objects and the target objects in the view. There may be further target objects outside the view that are unaffected by the execution. Additionally, for a Query execution, an OCL query is executed on the trace data. No actual target models are required. An update Query, View or Transformation execution compares an old correspondence between source objects and transformed objects with a new correspondence between changed source objects and correspondingly changed transformed objects. The correspondence changes may be used to enforce or check for corresponding creations, deletions and updates in the target objects. The declarative transformation languages do not have fixed sources and targets, rather they have multiple domains some of which may be designated sources and others as targets. The direction of the transformation is chosen by selecting the domain to be used as a target. In practice it is often difficult to satisfy the bijective requirements of bidirectional execution and so many transformations are just unidirectional.